Calella, a busy resort in Costa Maresme, is situated in the Spanish province of Catalonia between Sant Pol de Mar and Pineda de Mar. The local inhabitants of Calella lived principally from the textile industry and fishing until the 1960s. 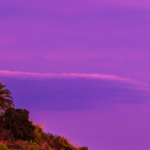 The following years have seen the old town of Calella become the modern tourist capital of the Costa Maresme, with 3 kilometres of sandy beach and tourist facilities of which they can be proud. 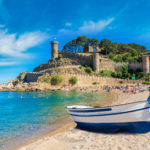 Calella is not far from the Costa Brava and must not be confused with the smaller resort of Calella de Palafrugell which can be found 60 km further north. The centre of Calella is busy: in summer, certain parts of the centre are even pedestrianised. Here you will find many shops, restaurants, bars, cafes and discotheques. Calella is very popular with the young due to its exuberant nightlife. The narrow roads of the old town were constructed around the church. 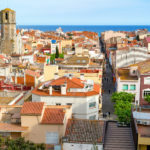 Calella is situated approximately 60 kilometres from Barcelona El Prat International Airport and 45 kilometres from Girona Airport, so it is easily accessible for anyone wishing to holiday in Calella on the Costa Maresme in Spain. Click here and look for your villa! 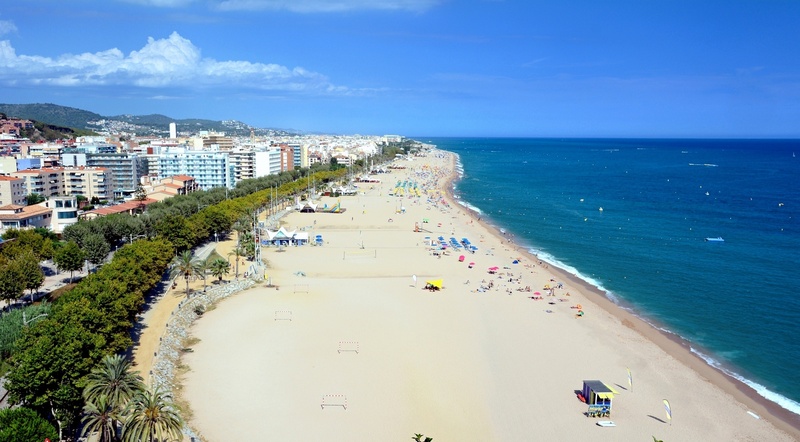 Calella: long beach with ultra-modern facilities and plenty of space. Come and get a tan whilst enjoying yourself on the large beach at Calella; there are many sporting activities available. 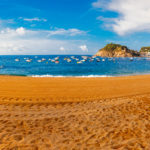 The shingle and sand beach of Calella extends over 3 kilometres with an area of 50,000 m2, which makes it without doubt the principal attraction of this resort on the Costa Maresme. Few beaches in Spain can compete with the modern facilities and options that Calella has to offer. Parasols, beach tents, showers, sunbeds and even a library on the beach are all available for you. Yes, here, everything has been thought of to ensure that your holiday will be unforgettable and a success! Thanks to the long stretch of impeccable beach, you don’t have to worry about overcrowding. Various water sports are offered, and you will also find a sports centre where you have the choice of many sports and games. 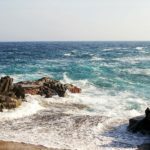 Surfing, sailing, water skiing, diving, kayaking, the banana boat and canoeing are just some examples of popular water sports on offer in Calella. However, you can also play tennis or golf, go mountain biking, walking or to fitness training. 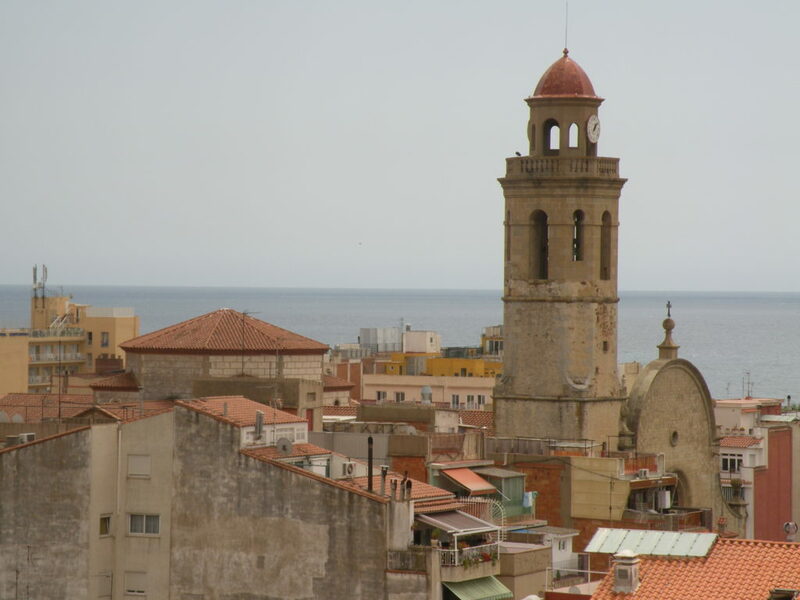 Calella, old town centre with historic buildings and pleasant shopping streets. 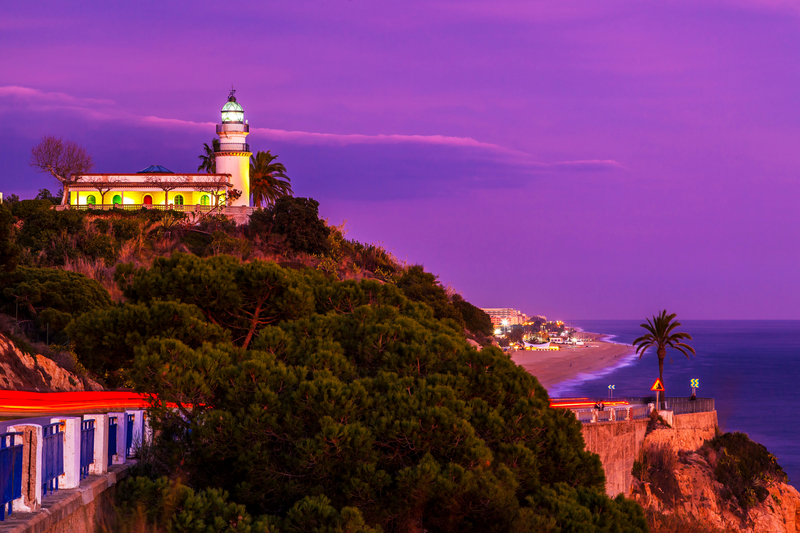 Culture lovers will also enjoy themselves in Calella on the Costa Maresme. The old town is home to many historic buildings,and you can stroll down the winding roads that circle around the Santa Maria church. Take time to admire the baroque entrance surrounded by statues of the 12 apostles. A little further, you will see the house of the famous family of Salvador Saga dating from the 14th century. The Museum of Calella has 12 exhibition halls where you can browse through history from the pre-Roman epoch right to the present day.A walk in the beautiful Dalmau Parkor taking the small train which runs through the town are well worth the effort. Carrer de L’Iglesia is the main shopping street and has many pleasant shops, not to mention traditional Spanish tapas bars and bodegas where you can end the day in a convivial way.In the south-west of Calella, you will find the lighthouse, dating from the 19th century, and the ruins of the two Torretes de Calella,which were constructed in the same century to enable communication by semaphore. The lighthouse was built in 1859 and was designed to defend against African attack. It was originally lit by a petrol lamp but has now been modernised and is still functional. In Calella on the Costa Maresme,the food is excellent. From amongst 125 restaurants, the Maritim, El Hogar Gallego, Manduk, Roma, Canape and the Olivera are strongly recommended. As well as paella and the world-famous tapas, you can also find delicious salads, dishes of meats and cheese, seafood and stews. Not only do we have the traditional Catalan dishes, but also the option to eat Chinese food, pizzas and kebabs. Washed down with a good sangria or a sparkling Cava, your dinner will be a sure success.